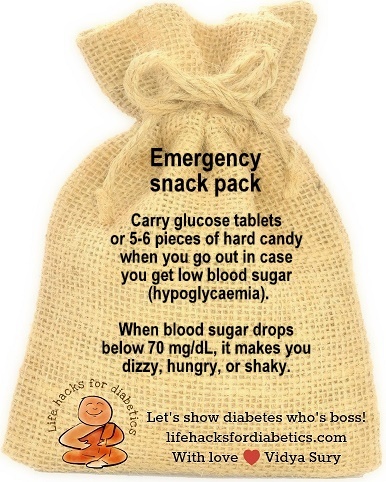 Always carry glucose tablets or 5-6 pieces of hard candy in small bags when you go out in case you get low blood sugar. Low blood sugar or Hypoglycaemia is when blood sugar drops below 70mg/dL, causing dizziness, hunger and trembling. This often happens when you skip a meal. Or get too much exercise without enough food.